Rev up this Singapore Race Weekend with a Stellar brunch! The roar of engines, the exhilarating excitement as race cars zip past, and the buzz of the crowds – there’s nothing quite like an experience at the race tracks! While the anticipation for the Grand Prix weekend is building among the Chope team, that isn’t the only thing that we’re excited about: Stellar at 1-Altitude, known for their progressive Australian cuisine and even more breathtaking views of Singapore, is partaking in the race weekend festivities with the world’s highest Wagyu BBQ Brunch that offers a bird’s eye view of the circuit! We can’t think of a better way to enjoy the race weekend that over a luxurious brunch session at one of the best dining spots in town. A top-notch Wagyu barbecue spread and a dizzying array of fresh seafood, charcuterie, and other live stations? It’s almost impossible to resist. The view at Stellar is not the only thing that will take your breath away. Just wait till you see the star of the Wagyu BBQ Brunch: the Mayura “Steam Ship” comes as a whole quarter of the flavoursome Mayura Wagyu, roasted slowly over coals. Perfectly charred on the outside while staying tender and juicy within, this bad boy’s the ultimate indulgence. For variety, there are also other succulent grill items such as Tajima sausages and mini burgers, Tajima satay, prawn skewers, miso salmon, and more offered on the menu. The decadence doesn’t end there: load up on fresh bounties of the sea like Fine de Claire oysters, sashimi, and sea bass confit that’ll have you raving for days. It wouldn’t be a brunch if we didn’t mention the selection of brunch favourites – the French toast with strawberry and lavender honey is undeniably irresistible, and let’s not forget the ever-popular smoked egg Florentine with vadouvan spices. The very thought is sending us in a midday frenzy! Other worthy mentions include the pan-fried goose liver, smoked French chicken breast, Iberico ham, duck rillettes, and chorizo. Need something to cleanse your palate? The fresh salads and pasta are at your disposal. Have a sweet tooth, you say? Be prepared to gorge on irresistible treats like the torched kumquat Alaska, pineapple panna cotta shooters, and other sweet delights such as cakes, truffles, tartlets, macaroons and eclairs. Need we say more? For a spread this luxurious, $140++ per person ($180++ for unlimited pourings of Prosecco) is a steal! Looking to indulge in the seafood selections only? 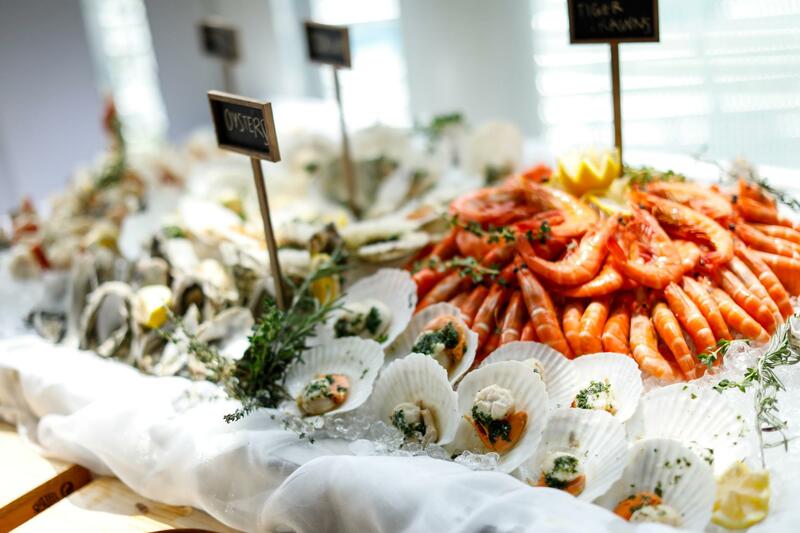 They’ve got you covered too with a seafood buffet that’s only going for $108++ with a free flow Prosecco option for an additional $40. Plus, it’s only available on 16th and 17th September 2017, 12pm to 3pm at Stellar at 1-Altitude. In fact, score 10% off your bill, just for being a Chope diner, when you book with the promo code LTBST*. So be sure to book a table now and treat yourself! P.S. In celebration of the Grand Prix weekend, the restaurants under 1-Group have lined-up 5 unique brunches to cater to your cravings! Click here to find out more. Find it at 1 Raffles Place, 62F, Singapore 048616. *Only one promo code can be applied once per reservation.